One of the reasons needlepoint has been favorite for centuries is its simplicity and portability. Just a few easy-to-find needlepoint supplies are all you need. The essential equipment for needlepoint embroidery couldn’t be simpler. All you really need is needlepoint canvas, yarn, and a tapestry needle. Of course, there are a few other tools and accessories that make needlepoint easier and more fun. You will also need additional supplies if you decide to create your own needlepoint designs. The three essentials for any needlepoint project are canvas, yarn, and needles. You can find all three at needlepoint or embroidery supply stores or online. Canvas. Needlepoint is always stitched on a foundation of canvas fabric. The canvas you need is explicitly woven for needlepoint and is different from the type of canvas used for painting or other purposes. Needlepoint canvas comes in a wide variety of sizes, from ultrafine gauze canvas typically used to make little items for dollhouses, to heavy-duty canvas made for stitching needlepoint rugs. Learn more about needlepoint canvas. Needlepoint yarns and threads. A wide variety of different yarns and threads can be used for needlepoint, from Persian yarn woven specifically for needlepoint to embroidery floss, pearl cotton, and metallic threads. Learn more about needlepoint yarns and threads. Tapestry needles. Regular sewing needles are too sharp-pointed for needlepoint. Tapestry needles are used instead because they have blunt points that slide through the openings in the canvas, and large enough eyes to hold several strands of yarn or thread. They are available in sizes from #26 (shortest, with most excellent point and smallest eye) to #13 (longest, with the thickest point and largest eye.) Buying a package that includes several different size needles will guarantee that you’re ready with the right size needle for any project. Learn more about tapestry needles. 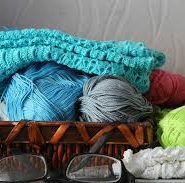 The simplest way to get started is to buy a needlepoint kit that contains everything you need: a piece of needlepoint canvas with a design pre-painted on it, yarn or thread pre-cut in the right quantities and matched to the gauge of the canvas, a needle of the proper size, and instructions. In addition to the essentials, a few other tools will help make needlepoint easier and faster. They can be found at local needlepoint stores or online. Scissors. It’s helpful to have two pairs of scissors on hand for needlepoint: a pair of dressmaker’s shears for cutting canvas, and a small, sharp pair of embroidery scissors for trimming yarn and cutting out mistakes. Masking tape. This is used to bind the raw edges of the needlepoint canvas to keep it from unraveling or catching on things during stitching. Needlepoint frame. A frame stretches the canvas taut and holds it in place while it is being stitched. This helps make the stitches more even, reduces wear and tear on the yarn and canvas, and can reduce fatigue on a needle pointers hands and arms. While not everyone uses a frame, many needle pointers consider them essential. Frame stand. A stand adjusts to hold the frame in the perfect position for stitching and completely frees the needle pointers hands. Stands can be expensive, so they are usually used by serious needle pointers. Magnifier. A magnifying lens reduces eyestrain caused by working on tiny stitches. The more delicate the yarn and canvas you use, the more helpful a magnifier will be. Needle Threader. This can make less of a struggle to get thick threads and yarns through the eye of a tapestry needle. Thimble. Helps protect the fingers during stitching. Laying tool. A long, stiletto-like tool that helps align the stitches and make them lie more evenly on the canvas. Large needles, sewing stilettos, and other household objects can be used for laying tools. Waterproof markers. Use one of these to outline the canvas onto a piece of paper before you begin stitching, to make it easier to straighten the canvas by blocking it when it has been completely stitched. They are also used to mark needlepoint designs on the canvas. It’s important to make sure the marker is waterproof to avoid staining the yarn during blocking or when the needlepoint is used after it is completed. While the supplies described below aren’t necessary if you use a design that is already painted or charted for you, they are essential for creating your needlepoint designs or copying images from other media to use for needlepoint. Tracing paper. This is used to trace an image from a book or photograph, then laid under the canvas so the design can be copied onto the canvas. Graph paper. Used to draw a chart of a needlepoint design that shows the exact placement of each color of yarn. Acrylic paints and brushes. These are used to paint a needlepoint design directly onto the canvas. When stitching, the needle pointer matches the yarn colors to the colors painted on the canvas. This method is less precise than charting the design on graph paper. Assemble these few supplies, and you’re ready to get started creating your own beautiful and durable needlepoint embroidery.